The UR5 robot arm weighs only 40.6 lbs, has a payload of 11 lbs, and reach capabilities of 33.5. The six-axis robot arm's repeatability is +/- .004, which allows quick precision handling of even microscopically small parts. Unlike room-sized, heavy automation technology, the lightweight and flexible UR robot can be used directly alongside humans with no safety guarding; innovative force- sensing technology enables the robot to automatically stop operating if it comes into contact with an employee. Of the 1,600 robots sold worldwide, 80% of these operate with no safety guard. 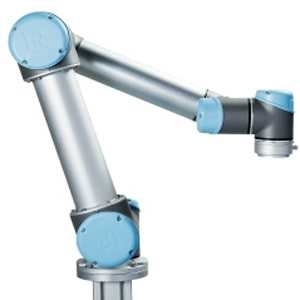 Training a UR robot to perform a task can be done via the intuitive touchscreen provided with the robot or by simply grabbing the robot arm to demonstrate desired movement. The Universal Robots are a result of many years of intensive research in robotics. They can easily be implemented in all sorts and sizes of industry; from a small CNC lathe production to large automobile assembly lines. Custom end-of-arm tooling is available through third-party providers for additional flexibility and specialization.